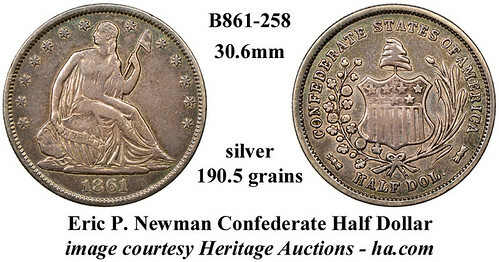 It's always an exciting event when an important piece of Confederate numismatica goes on the auction block – well, at least to me it is! Only four of the famed Confederate half dollars were struck and one of those resides in the ANS collection, leaving just three available to collectors. Of those three, the specimen thought to have belonged to President Davis was sold in the October 2003 Stack's Bowers Galleries Auction of the fabled John Ford collection to Donald G. Partrick for $632,500. Mr. Partrick later sold his coin in the January 2015 Heritage Auctions sale for $881,250. A second specimen, thought to have been originally presented to John Leonard Riddell, was purchased by Henry P. Kendall who later sold it in a March 2015 auction by Stack's where it realized $646,250. The specimen now offered by Heritage Auctions is from the Eric P. Newman Numismatic Education Society and this is its very first public auction appearance, having been held by the society for many years. The added significance of this sale is that all three privately held Confederate half dollars will have appeared at auction since 2015. With all three coins now likely to be in strong hands, the probability of another auction appearance by one of these rarities in the foreseeable future is quite small indeed. 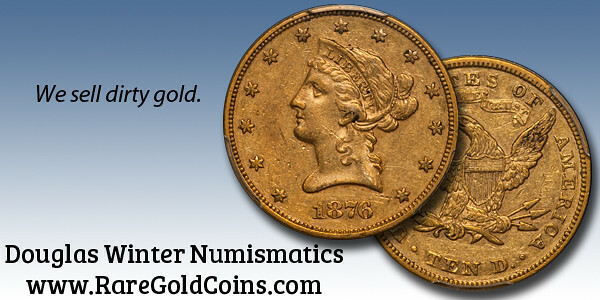 Most collectors have at least a passing familiarity with these J. W. Scott white metal tokens. After Scott acquired the Confederate Half Dollar reverse die in 1879, he planned to stamp the Confederate reverse over the existing reverse on 500 US Half Dollars, thereby producing the “Scott Confederate Half Dollar Restrikes”. Before risking the potentially fragile die on the hard silver coins, however, Scott and his assistant, David Proskey, deemed it advisable to strike 500 tokens in softer white metal so that they would at least have something to deliver to their customers if the Confederate die broke. The die survived both the tokens and the silver restrikes and the rest, as they say, is history. 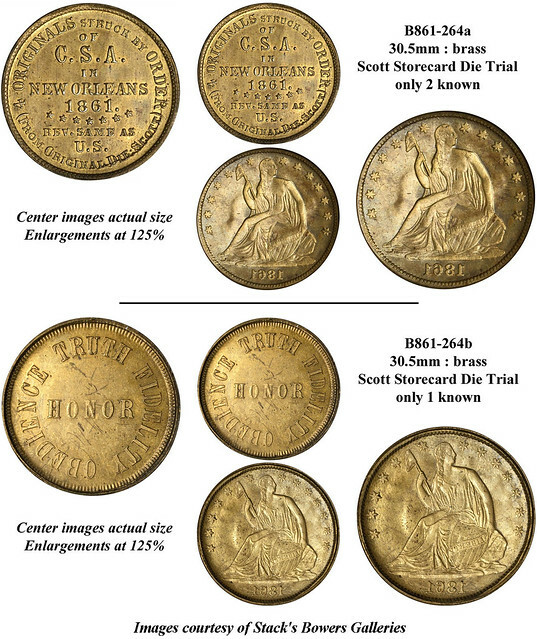 But now comes a fascinating footnote to the story – prior to striking his white metal tokens, Scott apparently first struck some die trial pieces in brass and three of those previously unknown trials will be auctioned by Stack's Bowers Galleries (From the estate of F.C.C. Boyd, May 1954). All three were struck on thin, well made, brass planchets using an 1861 half dollar coin as the reverse die, thus creating a reversed impression of the Liberty Seated design on the planchet. Two of the trial pieces employed Scott's storecard type die for the obverse, and the third obverse die has HONOR in the center, with OBEDIENCE TRUTH FIDELITY around – a die with which I’m not familiar.